I was a bit hesitant to pick up This Cruel Design because I thought I didn’t like This Mortal Coil. Even though there was a lot wrong with it, but I did like it and made me want to read This Cruel Design. 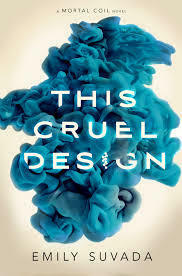 I give This Cruel Design by Emily Suvada four out of five hearts because it was very interesting and the end made me want to read the next and last book in the series. To be honest, I had a hard time reading in the beginning. I couldn’t remember half of what happened in the previous book and so a lot of the knowledge I needed to be hooked wasn’t there, like some of the revelations about Kat where hard to swallow. But once I got up to speed it worked fine and all my problems were gone. I enjoyed Cat’s wit and her two sides sort of fighting with each other. Her relationship with Cole was questionable but it does make me curious how this is going to end. Emily Suvada has written a very interesting story again, but I do wonder whether she just didn’t reuse the premise of her first novel and edited a little to make it seem more interesting. The end made me want to read the next one, so maybe just before the release of the last novel I will reread the first two novels. This entry was posted in Book Review and tagged Adventure, Book Review, Drama, Dystopia, Emily Suvada, Mystery, Romance. Bookmark the permalink.